AQURON 1200 is an easy to apply and environmentally friendly water repellent for Australian concrete and masonry. MARKHAM GLOBAL Australia are suppliers and application experts of AQURON 1200 water repellent. Proven in Australasian conditions and ideal for architectural finishes when a natural appearance is the final desired finish for concrete, masonry and concrete precast. With simple low pressure spray application AQURON 1200 produces a invisible water repellency on vertical surfaces by forming a invisible chemical surface tension on the treated. As AQURON 1200 is not a membrane, it provides a breathable type water barrier beneath and to the surface. Preserving the natural appearance of the masonry and concrete precast is achieved by the application on AQURON 1200 water repellent while helping keep surface clean and reducing maintenance. AQURON 1200 water repellent retards or eliminates efflorescence and its application resists cracking and spalling of vertical and horizontal surfaces from successive freeze thaw cycles. AQURON 1200 must be applied to a natural concrete surfaces. Any previous coatings must be removed prior applying AQURON 1200 water repellent. 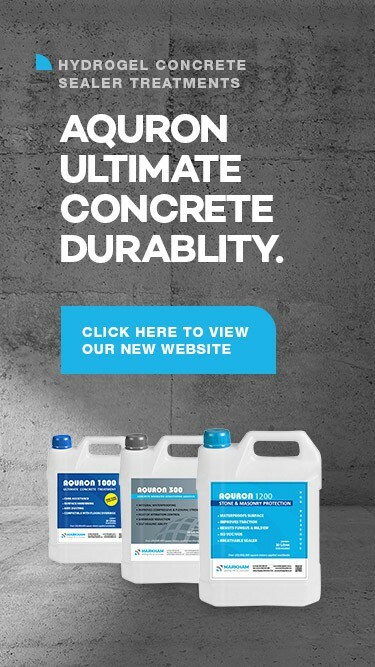 AQURON 1200 results ULTIMATE concrete water repellency for any Australian Concrete structure requiring a natural look. Our Australian team looks forward to helping you with any questions relating to how our products can help you achieve the best solution for your projects, call us or email us a question. Call MARKHAM GLOBAL Australia on 1800 693 694.